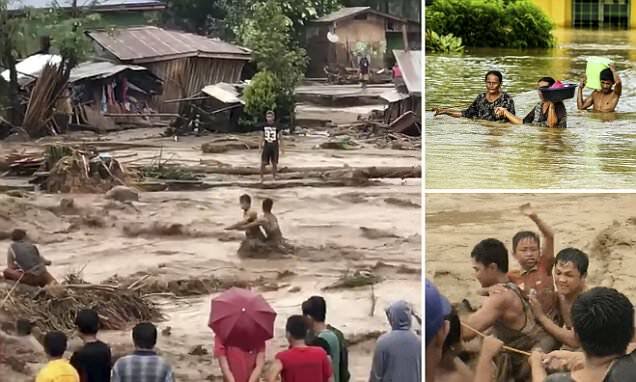 A man tying up his boat in the Philippines during Tropical Storm Tembin was eaten by a crocodile as the death toll from floods and landslides caused by the storm rises to 113. Villagers found their communities facing an onslaught of water and mud as they desperately tried to make it to safety. Elsewhere villagers waded through flood water with what belongings they could carry. Police said some villages have been completely swept away. 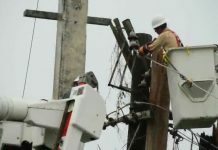 Tembin struck less than a week after Tropical Storm Kai-Tak left 54 dead and 24 missing in the central Philippines. A crocodile killed and ate a man, Abdulsalam Binang Amerhasan, who was securing his boat on the western island of Palawan as Tropical Storm Tembin bore down on the Philippines. When Amerhasan failed to return home, his worried wife sought help from neighbours who launched an overnight search. The community searched along the river ‘until they found out that the lifeless body of the victim was still (being) tumultuously bitten by a crocodile‘. Trees havent resisted the powerful winds of tropical storm Tembin in the Philippines. A swallen river after heavy rains in the Philippines. Police, soldiers and volunteers used shovels to dig through mud and debris as they searched for bodies in the village of Dalama on Saturday. 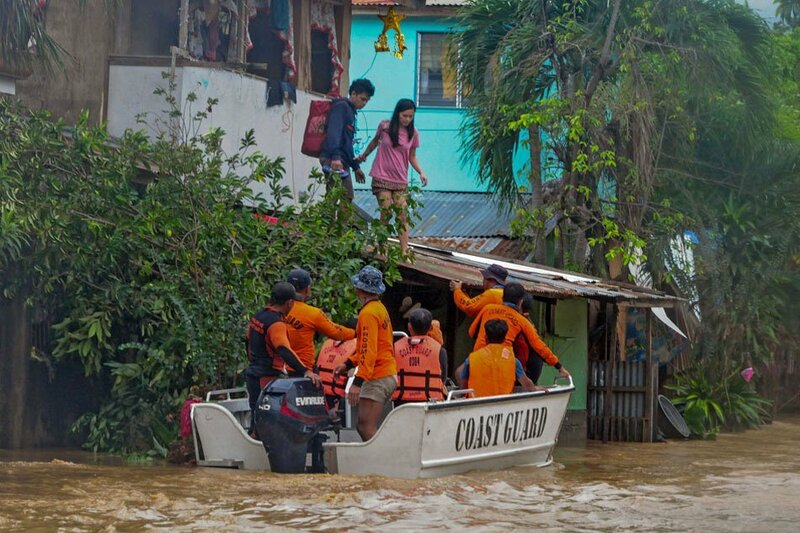 ‘The river rose and most of the homes in Tubod town were swept away. The village is no longer there‘. Rescuers meanwhile retrieved 36 bodies from the Salog River in nearby Sapad town on Saturday. 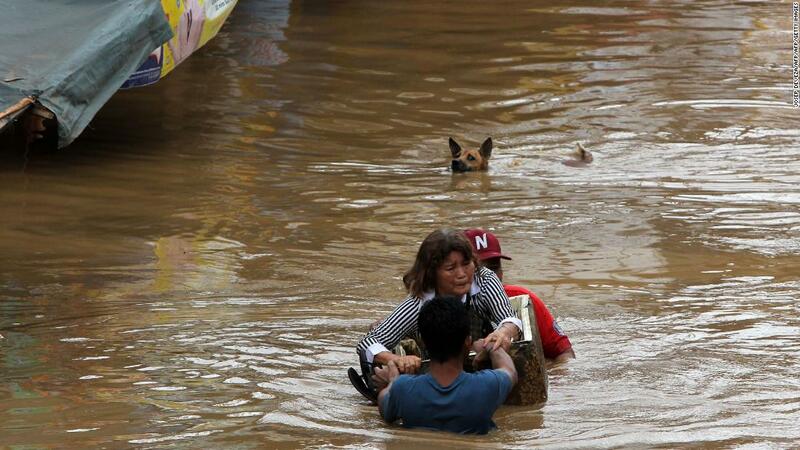 Villages have been devastated and flash floods killed at least 133 people but the storm continues in the Philippines. 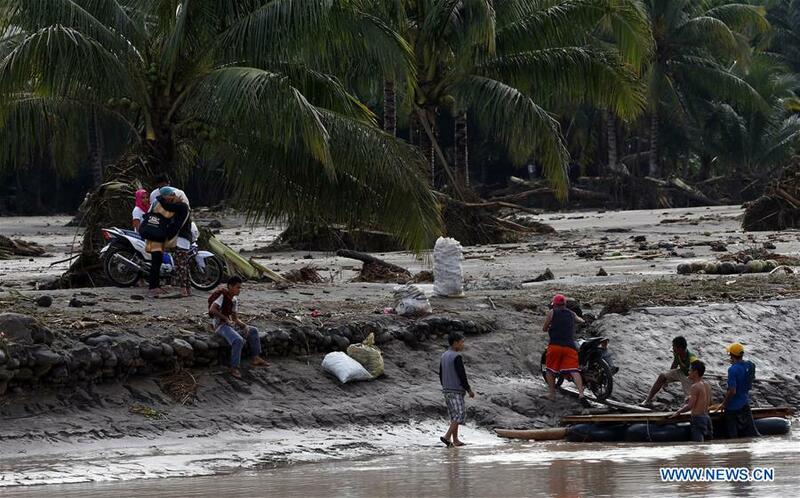 The bodies in Sapad were swept downriver from a flooded town upstream called Salvador. Authorities in Salvador said they had retrieved 17 other bodies upstream. Tubod, Salvador and Sapad are in Lanao del Norte, which is one of the provinces hardest hit by Tembin. 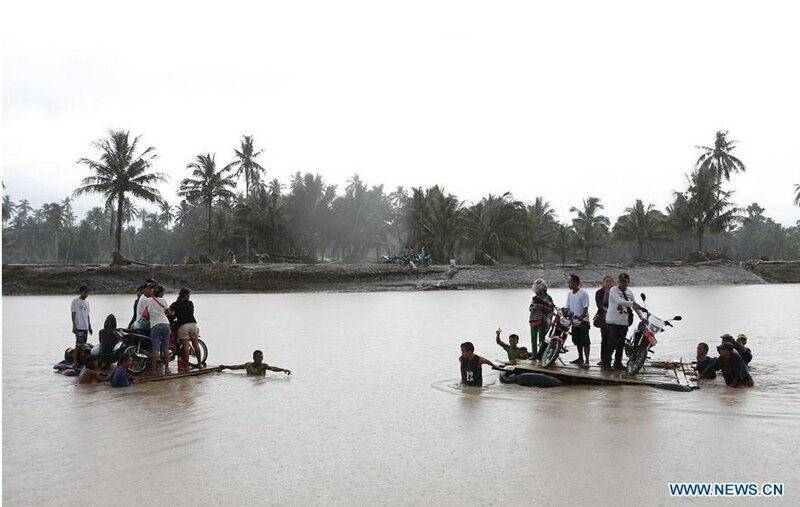 After Temblin: villagers cross a river on makeshift rafts in flood hit town of Salvado in Lanoa del Norte province. 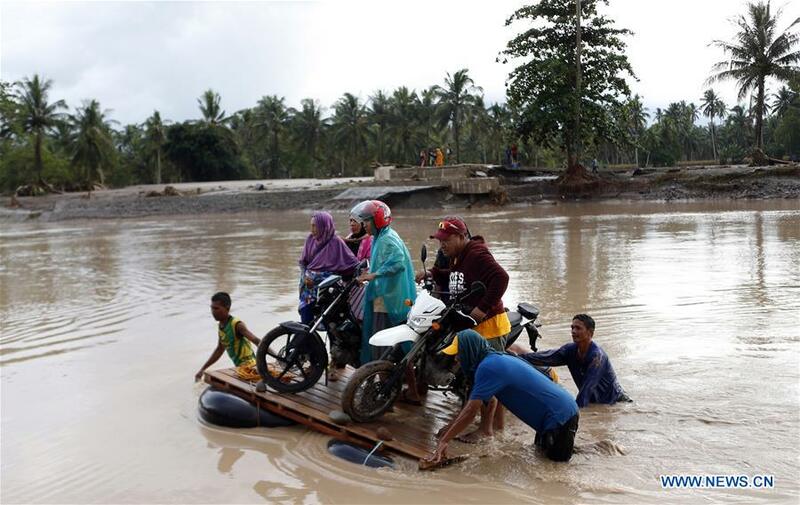 The state weather service said Tembin was expected to hit Balabac and Bataraza late Saturday after killing more than 100 people on the main southern island of Mindanao, triggering flash floods and mudslides. 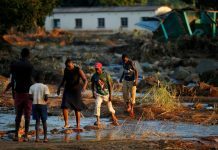 The death toll from Temblin climbed swiftly to 133 on Saturday, as rescuers pulled dozens of bodies from a swollen river. 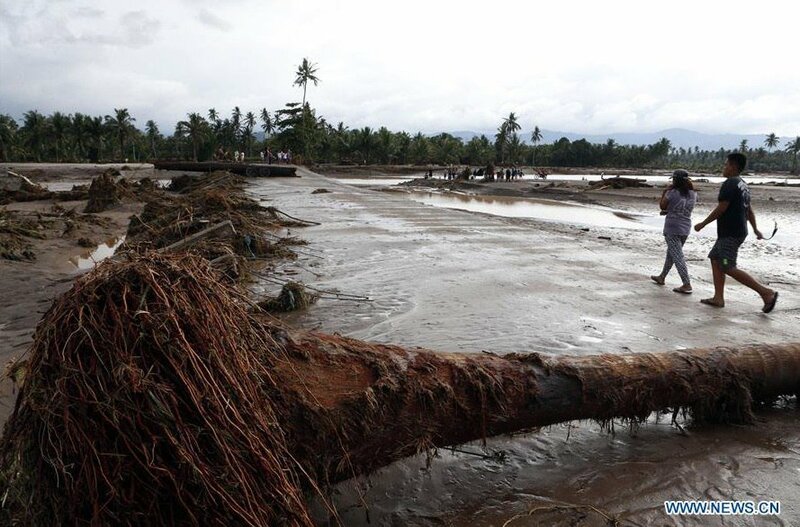 More than 130 people have been killed as tropical storm Vinta, also known as Tembin, caused massive landslides. Althought the Philippines is pummelled by 20 major storms each year on average, Mindanao, home to 20 million people, is rarely hit. The death toll for Mindanao’s Zamboanga peninsula also rose to 28, and police said 81 people were missing after mud and rocks swept down coastal communities in Sibuco and other fishing towns. Moreover, landslides had blocked rescue and relief convoys to the impoverished region. 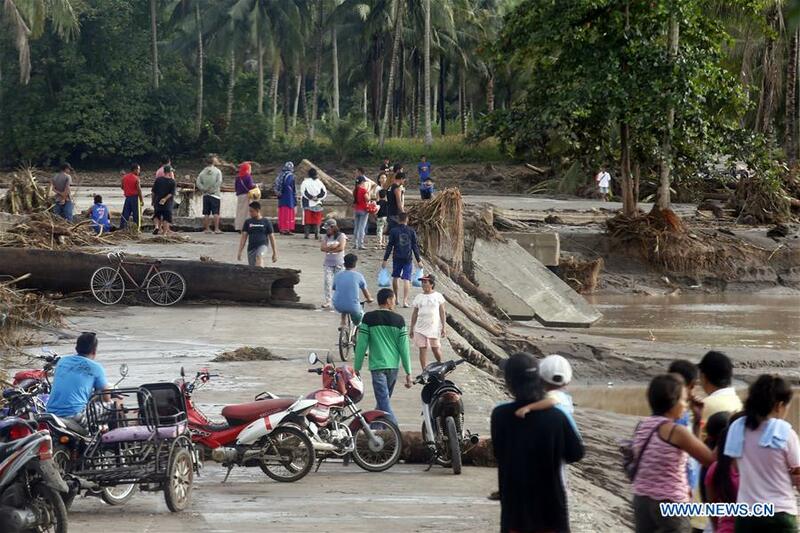 Tembin struck less than a week after Tropical Storm Kai-Tak left 54 dead and 24 missing in the central Philippines, straining the disaster-prone nation’s resources. 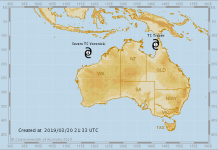 The state weather service said Tembin is expected to hit Balabac, a fishing island of 40,000 people in the western Philippines late Saturday with gusts of 115 kilometres (71 miles) an hour.